The initial database search of the TUM team revealed more than 10,000 scientific articles which were concerned with the topic. Of these, 39 articles were identified for a relationship between genetic factors and total energy, carbohydrate, or fat consumption. "In all studies, we most frequently encountered the fat mass and obesity (FTO) associated gene as well as the melanocortin 4 receptor gene (MC4R). 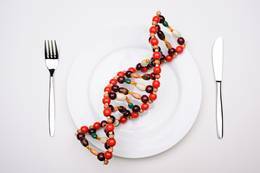 There are indications of a relationship between these two genes and total energy intake," explains Christina Holzapfel, PhD, from the Institute for Nutritional Medicine at the TUM." However, the evaluation of the studies did not provide a uniform picture: "There is only limited evidence for the relationship between the FTO gene and low energy intake as well as between the MC4R gene and increased energy intake."